Tech-Tamer originally re-wrote and re-organized the MSPP INTERFACE Referral Service website using custom coding in PHP to better show off its deep resources of knowledge about mental health care organizations. Large portions of the site are entirely database driven and are maintained by the INTERFACE staff through a web interface. 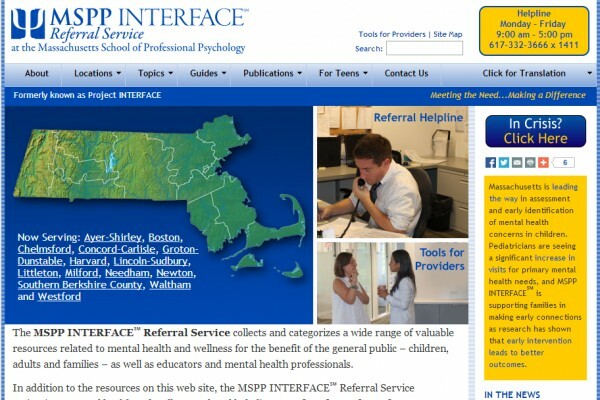 Even more important than the public website, MSPP INTERFACE also provides a referral service that connects callers with mental health providers, backed by a continually updated database of detailed information about thousands of mental health providers in Massachusetts and nearby states. In 2014, Tech-Tamer moved the original database to a Drupal backend and used SOLR to provide faster and better faceted searches so that counselors based in any location can find better matches for INTERFACE’s clients.